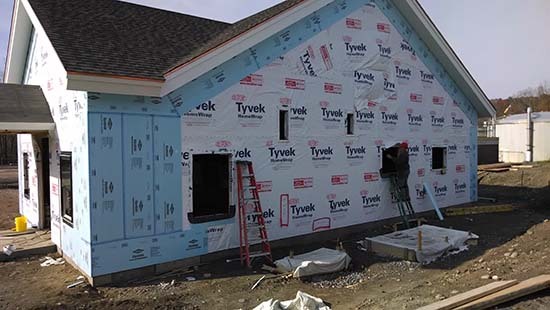 Today more than ever before homes are being built with foam board insulation installed on the outside of the sheathing and under the siding. This detail is used with both new construction and also with renovation work. Below are some of the design details along with the benefits of installing exterior rigid foam board insulation. One of the biggest advantages to installing exterior rigid foam board insulation is improved moisture control. By installing insulation on the outside of the framing it causes the location of the dew point to move to the outside of the wall assembly. This reduces the likelihood of condensation within the wall cavity. The exterior insulation also helps keep the siding (all vinyl siding leaks!) further away from the exterior sheathing. Basically it creates another drainage plane that helps protect the sheathing and framing from damaging water infiltration. Exterior rigid foam board insulation can make a significant difference in overall thermal performance for a building. First of all it adds to the overall R value, which can be quite significant depending on the thickness and type of insulation used. If a 1 inch layer of XPS foam is installed it can result in an immediate increase in R value of 5 (20% increase for a wall with 6″ of R19 fiberglass). In addition to the increase R value, the bigger advantage in my opinion is the improved air infiltration that’s realized with a properly installed layer of rigid foam insulation. The reduced air infiltration results in a better overall performance of the insulation within the wall cavity. This is especially true if the wall is filled with fiberglass batt insulation. One of the most asked questions on our site is related to this article. Readers are constantly asking if the rigid insulation is supposed to be installed over the building wrap or vice versa. Dupont says you can install it either way, however we typically install the foam over the house wrap. It’s much easier in my opinion to do it in this sequence. To attach the foam board we use a cool tool from Paslode, their Cap Stapler does a great job holding the foam in place and also attaching the house wrap. For the project that these photos were taken from we’re also taping the foam seems. This is fairly typical however Dupont suggests leaving them “open” to help the wall assembly breath. Seeing that we’re using vinyl siding I think it’s better to tape the seam and keep out any water. By installing rigid foam board insulation on the exterior walls you’ll need to pay special attention to the details. You’ll need longer nails for nailing trim and siding. You’ll need to properly flash window and door openings. You’ll also need to pay attention to window and door extension jamb depths as they will increase if the window is mounted flush with the foam board. Energy costs are never going down at least in the near future. So investing in good insulation is always a great investment. 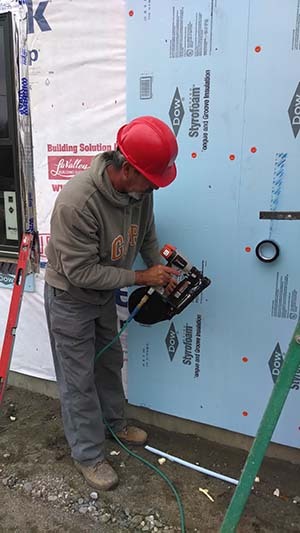 Using exterior rigid foam board insulation is a great way to make a building more energy efficient, quieter and more likely to prevent moisture infiltration problems. The method works for both new construction and remodeling and doesn’t affect siding and trim details very much. Bottom line is exterior foam insulation is a good investment. Excellent article Todd! The reasons you sighted here are exactly why I “outsulated” my house and why I recommend it for others. Moves the dew point and the drainage plane. I used poli-iso, fully taped, windows set on top of the foam, and then rain screen details. It’s a great detail, but there’s lots of confusion around the industry on the topic. Todd, would you recommend using 2″ rigid foam? I have a guest at my store who wants to do this. I have yet to find a good answer for him. Any input would be greatly appreciated. Thank you, Scott. 2″ is a mixed bag. There are people out there using 2″ but you’ve got two issues to deal with. First is you’d really need to strap over it so that you can nail siding (1″ is about the most I’d do with long nails). Secondly, at 2″ thickness, the foam acts like a vapor barrier, so it’s possible that water vapor that’s inside the wall might get trapped between the foam and interior vapor barrier. If an interior vapor barrier isn’t used, then this is less of an issue. Todd, I’m in the process of replacing old celotex fiber board with 7/16″ Zip-System sheathing. Now before I put up the new vinyl siding, I’m thinking that adding at least a 1/4″ fanfold foam layer would be a good idea, especially after reading your article. Is it a truly necessary step to have the foam on the sheathing before installing windows/doors or will it suffice to bring it right up the edges and just make sure things are taped securely? I ask as I have already installed a few windows directly to the sheathing. Thanks in advance. Dennis – with 1/4″ foam it doesn’t matter at all. Thicker foam requires different details that make it tough to do after the fact. Good luck. I was thinking of installing 3/4″ rigid insulation on the exterior of a stucco house. I have already installed new windows and firred them out 1 1/2″. I was thinking to install strapping over the insulation and siding over the stapping. Would you recommend I wrap the house before I insulate, after I insulate, or not at all? I live in Alberta Canada and am worried about condensation. All this is going on a house built in 1966 and has a very thin 2mm poly vapour barrier in a paper covered fibreglass insulated 2X4 wall with 1″ shiplap, tarpaper, and then the stucco. Don – Tough question. I’m going to pass on this one! I’ve never done it and I’d hate to lead you down the wrong path. My gut is telling me: house wrap, strapping, foam, then siding, so that there is an air space between foam and stucco….but I’d say speak with an local insulation contractor. We just don’t deal with stucco here much in our area. Hi Don, we are thinking of doing the exact same thing to our house in Ottawa, except our house is Angel stone instead of stucco. Did you end up getting an answer to this question? Would appreciate any wisdom you can share. Thanks! I’m replacing my vinyl siding on our ranch home and would like to install 3/4″ rigid foam board underneath but I’m concerned that this will change the measurement around the windows. There is no foam board under the siding now. The house was build in the 70’s. Should I go with 1/2″ foam board to be safe? This is my first time replacing siding. I’m trying to do my homework before I start. We live in PA when the temperature can get pretty cold in the winter at times. Greg – The bigger issue is sealing that foam well. If 1/2″ works better around the windows and doors, I’d stick with that, but do a great job sealing the sheets, air infiltration is a far bigger problem than the R value. OK. I’ll make sure I seal the sheets well. Any opinion about putting Tyvek over or under the foam insulation. There’s a lot of confusing information. Tyvek recommends putting the HomeWrap over the foam board. Correct? Greg – This topic is all over the place. The last two projects we built the architects had the foam on top of the building wrap.I think this is good because it allows the building sheathing to breath and not trap moisture against the sheathing or siding. If you install the foam board against the building directly, it can’t breath in the same way. Patty – I’d tend to agree with his approach, I’d be more concerned about the actual detail used over the old railing. Is it plywood, then building wrap, then siding? if so that sounds fine. I am thinking about replacing my siding. If I use 1 inch foam and tape the seams will I have moisture problems from the inside? I live in northern Kentucky. House was built in 1960. It has what looks like paper backed batting insulation. I think r13. 2×4 studs. This is only the top half. The bottom has some stone and some brick exterior against block. Thought about getting spray foam in that. Thanks for your help. My house in New Hampshire was built in 1983 and was the original contractor’s home. Almost all the houses this contractor built in my neighborhood were constructed without exterior sheathing–just the foam and siding. A framer who lives in one of those homes said there is metal diagonal bracing. He sheathed all the sides of his home (took him 8 years for all 4 sides) before re-siding. My home has wooden clap boards which I am tired of repainting, with quite a few areas of rotting trims and boards. Would like to have house sheathed –but the cost of doing it is too much too afford (house is 24 squares). Is replacing wood siding with vinyl and structural foam sheathing enough? Sue – without tearing off the old siding and inspecting the frame of the house it’s very difficult to say what is best. Foam plus wood siding is one thing (the wood has some strength, especially for impact loads), but foam and vinyl does give me some heart burn. If it were my home, I’d save some extra money and do the sheathing. Yes insulation will help. Be very careful with cement in contact with aluminum….it will have an adverse reaction. Thanks for the info, Todd. I’m preparing to replace the 30-year-old vinyl siding on my house in Virginia. Living near a busy highway, noise reduction is also a factor. I was thinking to apply housewrap (there currently is none), then 1/4 fan-fold insulation and non-insulated vinyl siding, or the housewrap then insulated vinyl siding. But different websites have me concerned about creating moisture issues with the sheathing in either case. Which choice would be best for noise? Could I create a new problem in the process? Miles – The 1/4″ won’t cause a moisture problem in my opinion (it will breath). I’d install house wrap then the foam. The foam will help a bit with noise. Todd, I am looking for best insulation wrap to go over asbestos shingles, and then siding. contractor said to use 1/2 inch wrap but r value is only 2.0 doesnt sound good to me.. any advise? Pat – The issue is a bit more complex. 1/2 inch doesn’t effect any of the window and door trims typically so it’s used quite often. When you go to thicker insulation, it usually means modifying the trim too accommodate the thicker combination of insulation and siding. I am considering building a new house. I am looking for the best combination. I will be using 2×6 walls with vinyl siding. I am either going with spray foam or wet cellulose. I had plans of 1/2 inch foil faced foam to overlap past the mud sill to have all openings covered. Am I creating moisture issues? What would you suggest? I will be building in central Illinois. Thank for your input. John – The best approach these days is having a continuous layer (usually about 2″) of foam on the exterior of the home. Then inside, the stud bays are usually insulated with additional insulation (fiberglass, cellulose (dry, not wet), or spray foam). This helps move the dew point out of the wall assembly to prevent moisture problems. The next best approach is using spray foam in the wall cavity. If you go with cellulose, my preference is using the BIB system with dry cellulose. Thanks for taking the time to answer my question. Please take some more time to explain the BIB system. Also, is the exterior of the wall sheathed with OSB or something else? Would metal T bracing and foam over studs be sufficient? For BIBS, there is always some sort of exterior sheathing. Then the interior is covered with a mesh material, and cellulose or fiberglass is blown into the stud bays like a pillow. Please explain the BIB system. Do you put OSB sheathing on the outside or do you metal T brace and put foam on studs or is that not recommended? Thanks in advance for your advice. I have a cement block wall on my garage that i want to side with vinyl siding…what type of insulation should i put betwwen the siding and the block wall, i am using firing strips 24oc…..i think the insulation will help firm up the siding as well. You can install 3/4″ foam board to match the firing strips. I am in the process of modernizing a 1960 ranch, on the water in Downeast Maine. The original sheathing is fire proof exterior gypsum board. My research tells me that it is structural but it is not intended as a nailing base. I’ll be replacing all the siding, windows and doors and intend to use 1″ or more rigid foam to beef up the insulation. I will most likely replace almost all the interior sheet rock and insulation as I redesign the framing. I’ll use only moisture resistant sheetrock. If I apply foam over house wrap, over gypsum sheathing, or wrap over foam, over the gypsum, I will have to apply vertical firing strips attached to the framing (long screws) in order to have some way to attach vinyl siding. Is this the simplest way to deal with all the issues I have to face in an exposed, moist environment? Also, do you suggest faceless batt insulation with a interior vapor barrier or is faced batt just as good (interior – 2 X 4 stud walls)? Paul – I would likely install the building wrap over the old sheathing, then the foam, then firing strips, then siding as you outlined. Faced is fine, just be sure to seal everything really well. Tim – We would put the house wrap on first, then the foam board just like I’ve shown in the article. Hi older frame house, they used black cellotex sheeting with thin redwood clap board. Over the years someone has installed alum siding over that. Taking old alum and clap board off. Walls have blown in insulation. Planning on osb sheeting over cellotex then tyvek. Do you think there is any issues so far. Any pros or cons with 1/4 in. Fan board then vinyl siding. Or just go with the siding. In Indiana. Don – Is there any sheathing other than the cellotex on the house? is that what’s holding the blown in insulation? I think this will work, but I’ve never done it. Probably the best bet is to get a local insulation company out, ask them for an opinion on any moisture issues. My cape style home in New England was built in the mid-late 1950s. There is no insulation in any of the downstairs exterior walls. Just a paper/foil barrier directly behind and in contact with the plasterboard walls. 2×4 construction with board sheathing and a black paper then the wood siding. In the next few weeks I am having the old siding stripped. Then Tyvek home wrap and foam insulation then new vinyl siding. The foam board portion of the job will cost about $1500. I am also considering blown in dense-pak cellulose, as my heating bills are high. Do I need to worry about moisture getting in and not getting out? Should I do both the foam board AND the cellulose, or just one or the other. We just purchased a Mobil home that has water damage. Looks like it’s from windows leaking and no overhang on roof as well as a poorly installed patio cover. The home has a product that looks similar to siding but it’s sheeted. When we opened up the inside walls there was batt type insulation, between the studs and it has no sheeting at all, no moisture wrap either. We would like to keep the existing outside material on the home and thought we would use a moisture wrap then are we supposed to use a board type insulation and the the siding (unsure which type). We live outside of Las Vegas so it very dry and hot but the temperatures will get to freezing sometimes. We have to remove and replace all doors and windows, so would we do that before the walls, siding etc. we are replacing the roof first and adding overhangs and removing the patio covers. Very confused how to repair the siding. Thank you for your answer in advance, your post are wonderful, thank you very much. I have a 1996 double wide mobile home that needs new siding and windows. The bid I just got is from a company that wants to put vinyl siding with foam insulation attached to the siding on over the existing siding. Is this ok. My siding is mostly in good shape. Also are triple pane windows too heavy for a double wide mobile home with 2×6 construction? I appreciate the help. I’m not a fan of putting vinyl siding over old vinyl siding. The windows should be fine however. Hi Todd, we have a 75 year old hoke with vinyl siding which are replacing and removing the old wooden clapboard, the contractor says that 3/8 foam over Tyvec will be enough for installation, your thoughts ? Enough for? That’s a loaded question, are the walls inside insulated? Hi Todd, my house was built in 1938. Im changing the siding. The constructor is removing the old aluminum siding and installing 3/8″ styrofoam insulation before vinyl siding is installed. Is that insulation ok? I have a mid 70’s home with old wood sheet siding that is rotting up to about 2′ from the bottom. I have cut and replaced some of it and also had to replace some of the studs and bottom plate due to rot. I am not thinking about just residing all areas with vinyl. Currently the home has simply studs, batting, thin tar paper and the wood siding. I want to replace it with sheathing, then tar paper and then foam and then install the vinyl. Im in SE Texas and the humidity id crazy. Well this order work well for my home? Sounds like a good plan of attack. What do you think about the Henry Blue skin over plank siding on a 1960 ranch with 1/2 inch foam board over top? Home is in New England. Walls have blown in cellulose. Attic has 16 inches cellulose. Too tight? Will it cause interior moisture problems? I s there any advantage/disadvantage to using both osb and rigid foam? Behind vinyl siding? In speaking with manufacturers of the rigid foam (R-Max specifically) they have said that House Wrap is not required as long as you seal the seams well. I know you mentioned that house wrap under the foam is the recommended order of operation but based on what I have found, it sounds redundant. Thoughts? It’s cheap insurance in my mind….tapes are not perfect and over time they are likely to have issues….belt and suspenders I suppose. I live in Montana and don’t have much insulation in my walls. I have asbestos siding (I’m pretty sure) and would like to put foam board over it, then possibly stucco. What are your thoughts?! Certainly possible. Many times projects cover over old asbestos siding. It really depends on the manufacturers specifications. 3/4″ is pretty thick to not have some sort of solid blocking. Hi Todd, I’m insulating a 700 square foot cabin with a walkout lower level with a concrete block Foundation. The upper part of the cabin has standard batting and no form of exterior insulation under the siding. The lower level has 2 in of XPS rigid foam insulation on the interior walls. We will be residing the cabin this summer and are wondering if adding 1 inch of XPS rigid insulation on the exterior walls and walk out will cause any moisture issues. 1″ foam on the upper isn’t a problem. 1″ foam on the lower is a potential double barrier if the lower walls are framed vs block.